What do you see? Why do you say that? What else do you see? Try not to divulge the name of each image until your students have had a good chance to investigate it thoroughly. You may also choose to read the artist statements aloud after the initial conversation has begun. 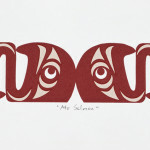 “In the spirit of spindle whorls, the Grand Masterpiece of contemporary Coast Salish graphics, this design depicts a human encircled by two salmon, four wolves and four thunderbirds. I wanted to create a graphic work that could rival early and classic one-colour Coast Salish graphic designs, such as Charles Elliott’s Salish Renewal and Stan Greene’s Human with Thunderbirds. Within the overall feel of the design, an Aztec calendar influence can be sensed in the circular form. 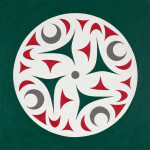 This cross-cultural aesthetic influence reflects the cultural reality of Coast Salish people living in the most urbanized and densely and diversely populated area of the Northwest Coast. Moving through the circles from the exterior inward, they change from air to land, then to the sea. 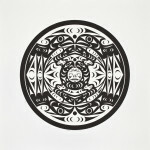 What could the image in the centre symbolize? What is the relationship between all of these things? Notice the entire image is created from Trigons, Crescents, and Ovals. Why would the artist do this? What do the triangles represent? The original painting is 6 feet across! Why would he make it so large? Why would the artist only use black paint on a white background? Discuss the use of positive and negative shapes. Can you find another face? (At the bottom). What is this? What is the artist lessLIE trying to tell us? lessLIE loves to play with words. Notice his name. What does this title tell us about the artwork? What does the poem tell us? Can you tell what object this is painted on? 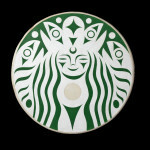 The artist lessLIE also built the drum before he painted it. What materials might he have used? Is this kind of copying okay? What are the differences here? Coast Salish people live between two very different worlds. One is full of tradition and the other is very modern. Does this artwork tell us something about that? “The overall form is the essence of the artwork and is meant to appeal on an emotional level. And, as one draws nearer, you can explore the content of the imagery and discover the unique different complexities. 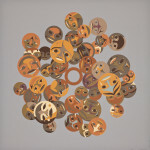 The circular format of the artwork incorporates a range of human faces, each one unique, celebrating the diversity of cultural and ethic backgrounds of people around the world … these faces also represent our local peoples from the past, present and future. What do you see/what is happening here? The faces of these people are all different? Who are they? Are they all from the same place and time? What are these people feeling? Are those eyebrows or birds on their faces? Why would the artist do this? What is the artist trying to tell us in this image? Susan Point’s works often reflect the shape of a traditional spindle whorl. Do you notice that shape here? What is happening here? Where are we? What is the relationship between these creatures? Notice that the entire image is made from Trigon, Crescent and Oval. (The eyebrows are conjoined crescents.) It also contains the spindle whorl shape. Why does the bird have a face in it’s body? Is this face human? The sun? The moon? There appears to be a horizon line in this picture. What time of day is it? 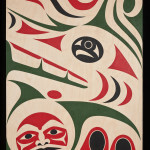 Note where the killer whale and (eagle/thunderbird) are placed on the background. Is this a division between air and water? The Killer Whale is a mammal. The parts of it which cross the ‘line’ change colour. Why? Why did the artist choose these colours? The name of this painting is Preservation. What is the artist trying to tell us? nor does the pond design to lodge the moon. How serene the water of Hirosawa! This poem points to a lesson of acceptance. The moon does not reject the pond nor does the pond reject the moon. They both simply are – with no intention or will from either of them, they create a profoundly beautiful scene. Read poem after initial discussion. What does this poem mean? Why would the artist choose an ancient poem from a distant culture? What part of the image is the moon and what part is the pond? Can you find anything in the pond? Reflections? Ripples? Pebbles? Frogs? Tessellation is a pattern that is made of identical shapes that fit together without any gaps and do not overlap. It is common in nature and in geometry! Is there a pattern that repeats itself here? “I like to tell the history of our people, and tell the legends of where we came from and who we are. One of the most important things for me in my work is to always remember that I’m part of a heritage, I’m part of a culture that’s been here for thousands of years, and I’ve only been here for thirty-six. What materials were used to create this artwork? What is the relationship between the bird and the human? Why are the human’s eyes closed? What are the similarities/differences between the two faces? What do you think the face within the bird symbolizes? 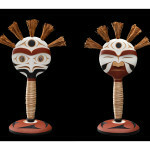 The Cowichan people believe that the first people fell from the sky as birds and transformed into humans. Can you find a story here? What could this artwork be used for? How many different animals or images can you see? What is the artist trying to tell us about the relationship between these creatures? Notice Mother Wolf’s eye. What is happening here? Is there another animal there or are we “looking in”? Wolves typically have sharp teeth like dogs. Why are this wolf’s teeth squared? Is there movement in this picture? What is a ‘harvest moon’? 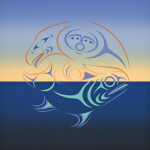 The artist gave this image the title Ate Salmon. How many salmon are there in this picture? What is he trying to tell us? Notice the connected mouths of the salmon. Why are they like that? Are all of the salmon identical? Do you notice a ‘mirror’ effect? Why did the artist choose to make this image elongated?